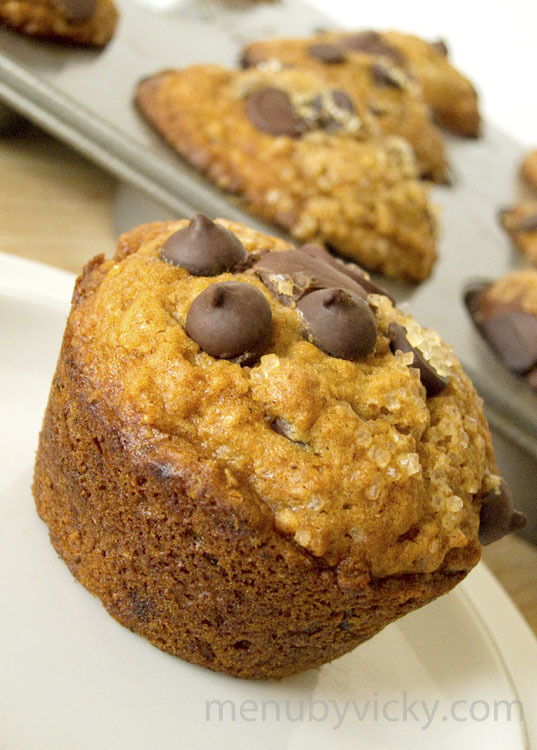 I came across this muffin recipe through a good friend of mine – Debra. She makes a version of these for her husband. Lucky guy! She gave me a few tweaks she made to the original recipe. And … since I’m not one to follow directions in the first place, I decided to further tweak the recipe by throwing in some buttermilk and Speculoos spread. I remembered still had a jar or two from a recent road trip to the US so why not? The result you get is a muffin that’s filled with a whole lot of banana and chocolaty goodness! You get an awesome crunch from the turbinado sugar with that first bite while the rest of the muffin is moist and tender and filled with gooey melted dark chocolate. Who doesn’t love that banana chocolate combination? The buttermilk gives the muffin an extra hint of tanginess and a soft and moist texture. 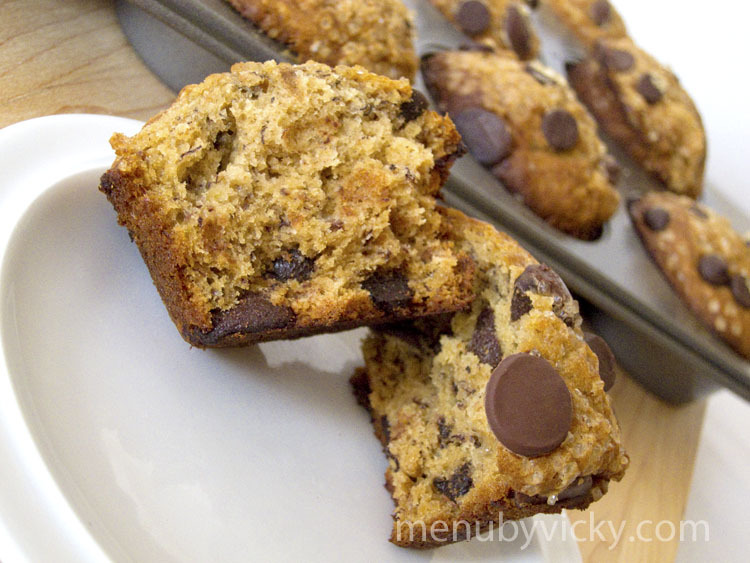 And the Speculoos spread fills each bite with a kick of spice giving these muffins an extra little something, making them so much more than just your ordinary banana chocolate chip muffin. Coat a muffin tray with cooking spray. In a bowl, combine the all-purpose flour, whole wheat flour, baking soda, baking powder, salt and mix together with a whisk. In a second bowl, add the white sugar, brown sugar and butter and beat. Add the mashed bananas, Speculoos spread, vanilla, egg and buttermilk and beat until combined with the butter and sugar mixture. Next, stir the flour mixture into the banana mixture, being careful not to over mix. Stir 3/4 cups of the chocolate chips into the muffin batter. Divide the batter evenly into the prepared muffin tins. 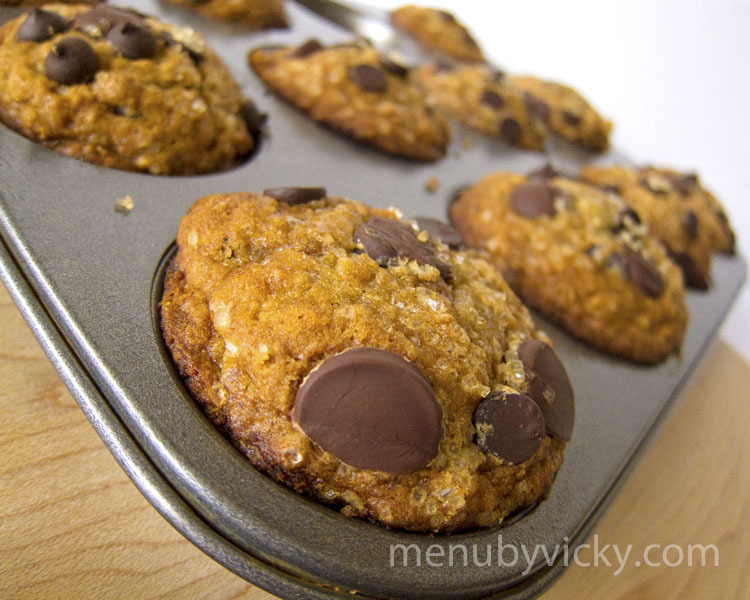 Sprinkle each of the muffin tops evenly with the remaining chocolate chips and turbinado sugar. Bake the muffins in the pre-heated oven for 17-20 minutes, until a tester inserted into the center of a muffin comes out clean. Remove the muffins from the oven and allow the tray to cool for several minutes. Place the muffins on a wire rack to finish cooling. Recipe notes: I added half of a banana and some buttermilk upon suggestions from Debra about the original recipe created muffins that were on the dense side. She told me I’d have to increase my baking time accordingly. I found that 375 degrees was a little on the hot side and I had to tent my muffin tray because I was worried about the muffins browning too quickly. Next time, I might try starting off at 375 and then turning down the oven half way through to 350. I always increase my cooking vocabulary when I read your blog. Must have been an irresistable treat to eat straight from the oven… You must have been the envy at the office this am.